Rats are becoming popular pets any where in the world. Go to a pet shop and you will surely encounter a rat for sale as pet. Fancy Rats are domesticated brown rats which are the most common type of pet rats. The name Fancy Rat derives from the idea of animal fancy or the phrase, "to fancy" which means to like, or appreciate. Dumbo Rats are unique fancy Rats because of their unusual appearance. These variety of rat have ears located lower than their head. They were named for their resemblance to “Dumbo” the Elephant. Oversized or overweight pets look amazing. One of them is the Zucker Rat which was bred to be a genetic model for research on obesity and hypertension. These fancy rats are capable of weighing up to 1 kilogram which is more than twice the average weight. This variety of fancy rat is called Hooded Fancy Fat which is name for its appearance. Like Himalayan Cats and Guinea Pigs, Himalayan Rats are cute-looking animals for pet. These tiny mammals have a unique color and marking variation. Black Rat or Rattus rattus is a common long-tailed rodent that originated Asia and became widely distributed in Europe in Roman Times. It can grow to a length of up to 46.4 cm and a weight of up to 340 g. Despite its name, the Black Rat exhibits several color forms. It is usually black to light brown in color with a lighter underside. There is also an unusual green tinted variety. The Sprague Dawley Rat is a popular fancy rat pet. It is an out-bred multipurpose breed of albino rat used extensively in medical research. They are well-like for their calmness and ease of handling. It can attain a weight of up to 520 g and a length of up to 10.5 cm. Sprague Dawley Rat can live up to 31/2 years. The Albino Laboratory Rat is a breed of rat with red eyes and white fur. It is an iconic model organism for scientific research in a variety of fields. Another awesome-looking albino breed of fancy rat is the active Wistar Rat. It was developed at the Wistar Institute in 1906 for use in biological and medical research. 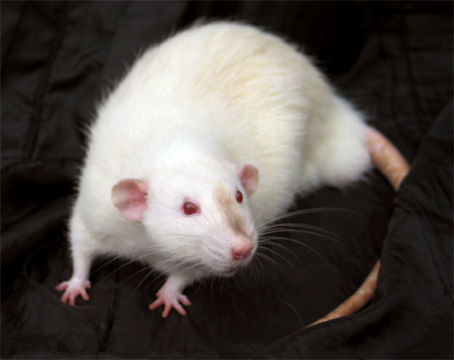 This breed of rat is presently one of the most popular rat strains used for laboratory research. It is characterized by its wide head, long ears, and having a tail length that is always less than its body length. The Long-Evans and Sprague Dawley Rat strains were developed from Wistar Rats. This fancy rat is a cool-looking fancy rat. The American Blue is one of several standardized coat colors. Some pet enthusiasts prefer hairless pets due to allergy reasons or for their unique appearance. Even though this rat is hairless, the markings on its skin indicate that it is a hooded rat. I found your blog because I was thinking about breeding rats again. I use to breed rats for pet stores and snake owners. When I had rats there was no Internet back then. I still made a good income. Now the sky is the limit with the Internet. Anyhow,I was wondering since I have been out of the rat business so long if you could tell me which rats are in demand and about how much I could get them for? Right now I am doing some research to brush-up on the breeding cycle and I want to provide my rats with the best care to keep them happy and disease free. Everything you had written is interesting and good to learn but I never found the Hairless Fancy Rats fancy. They are something different for me, something that I won't be preferring while having my pet. I had been taking help from the Pet Grooming Tips to know about the pets in detail.